A 7-year-old girl presented with lymphadenopathy and bruising suggestive of leukemia. Complete blood count was significant for white blood cell count of 479,000/mm3. Basic metabolic panel sent via pneumatic tube system was significant for potassium > 10 mEq/L. The stat venous blood gas potassium level was 4.6 mEq/L. A 12-lead-ECG showed sinus tachycardia without peaked T-waves. It was determined that this was pseudohyperkalemia associated with significant hyperleukocytosis. 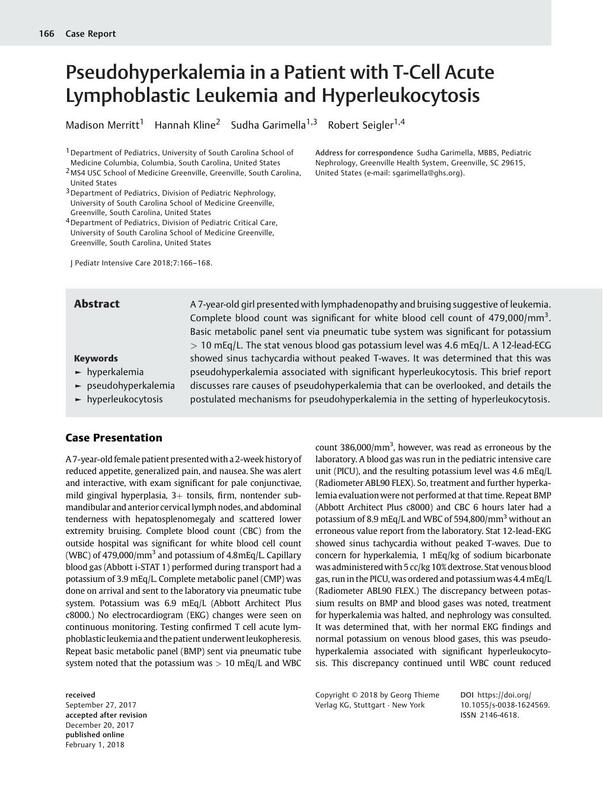 This brief report discusses rare causes of pseudohyperkalemia that can be overlooked, and details the postulated mechanisms for pseudohyperkalemia in the setting of hyperleukocytosis.